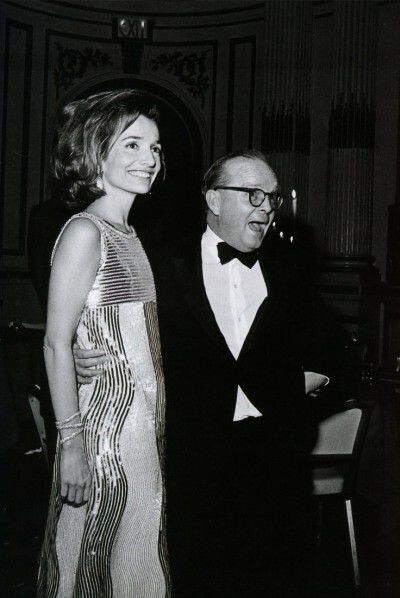 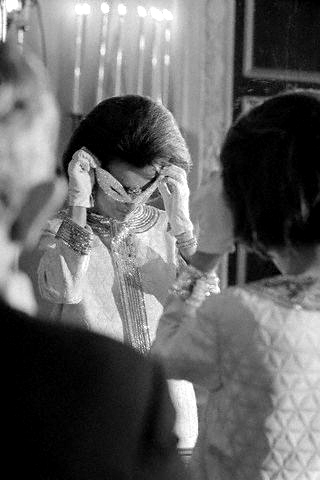 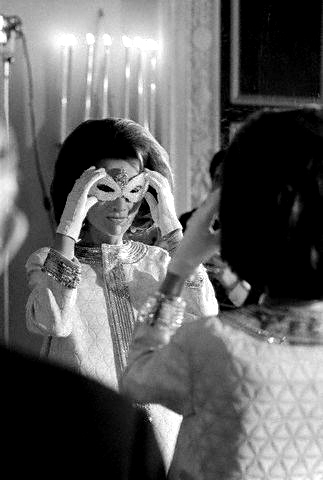 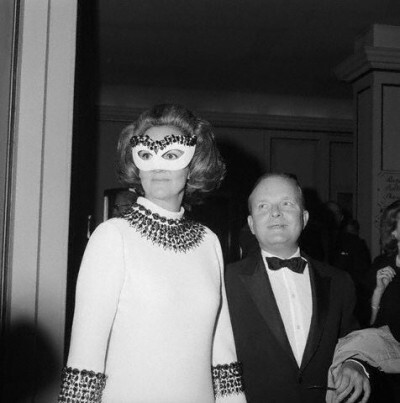 Masked Black & White Ball was the crowning event in the life of Truman Capote, an author at the peak of his talent and fame. Some may say it also was one of his greatest works ever. 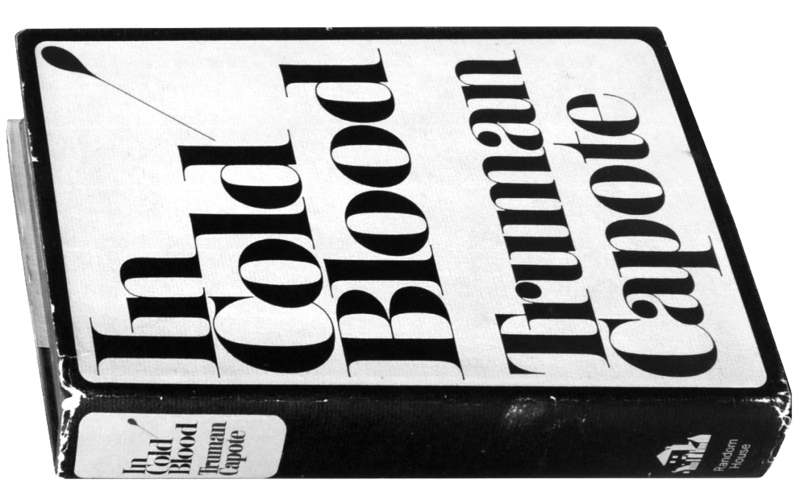 Released in 1965, “In Cold Blood” made Capote America’s most talked about writers. 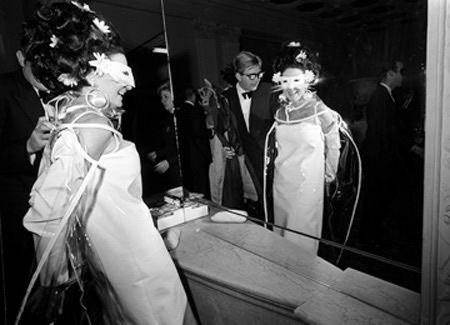 So to celebrate it, he decided to host a party that would be his “big, all-time spectacular present” to himself. 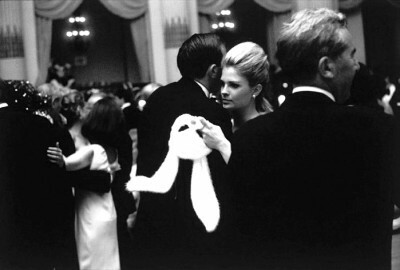 Held at New York City’s Plaza Hotel in 1966, which In Capote’s mind was the only decent ballroom left in the city, attendance was limited to 540, so it quickly became the most coveted invitation on every celebrity’s wish list. 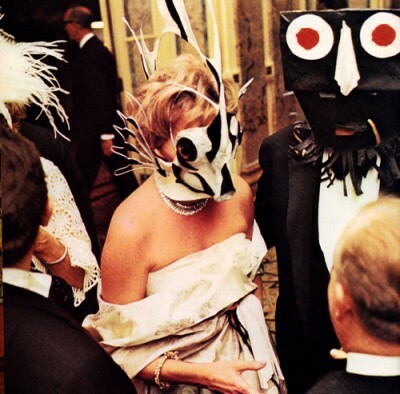 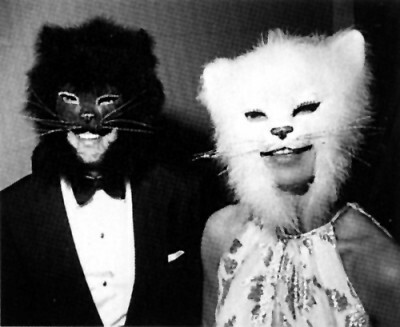 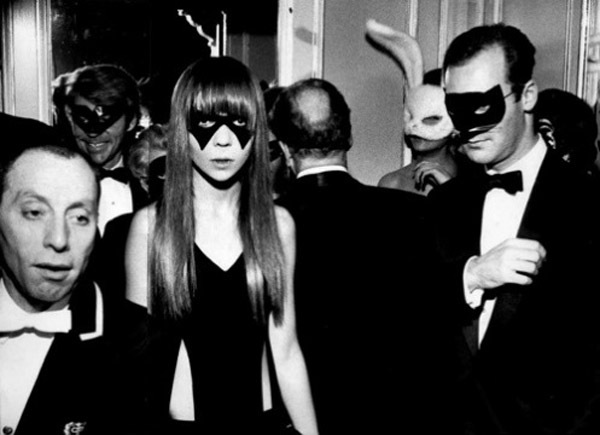 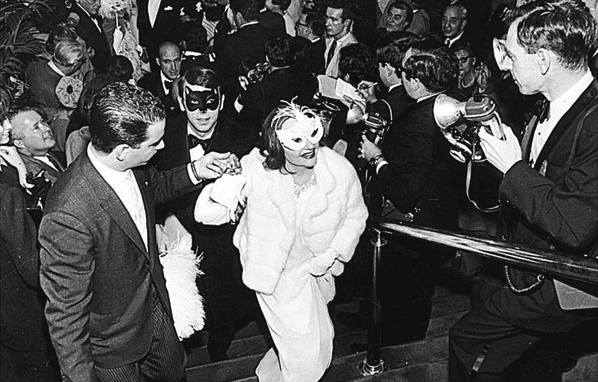 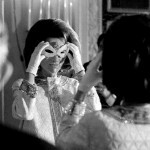 The Masked Black & White Ball was the ultimate social validation. 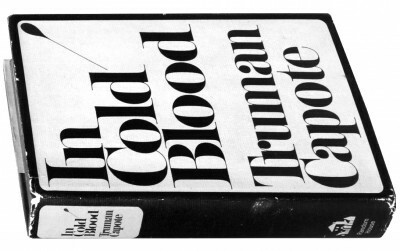 Soon the begging, bribes, and threats to be in began.The hounding got so bad, Capote even had to leave town for a while. 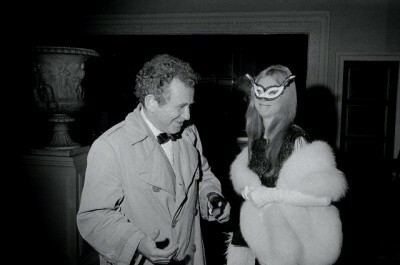 The final list was a mix of New York socialites, Hollywood idols, artists, authors and writers and political powerhouses. 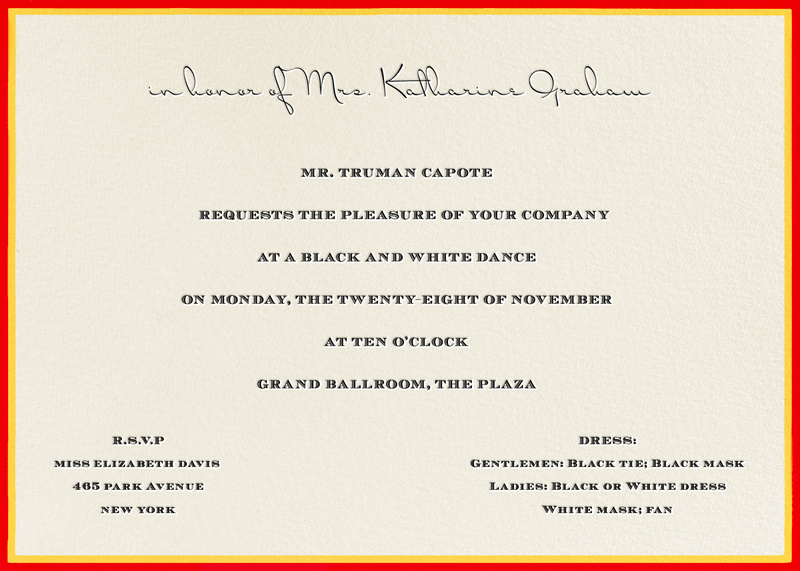 The invitations, printed by Tiffany & Co. 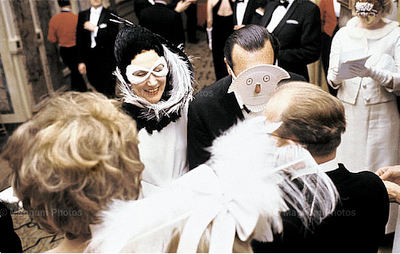 It specified black tie and black masks for men and white dress, white mask and white fan for women. 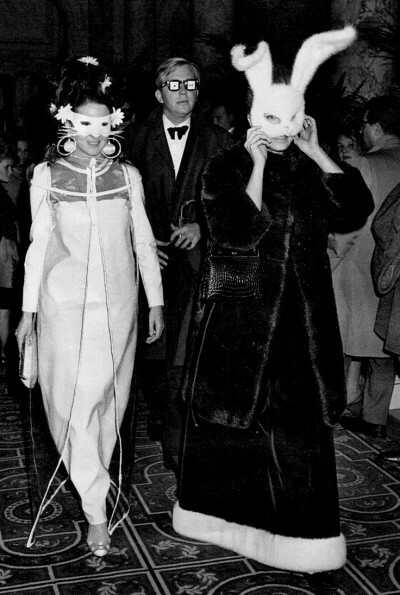 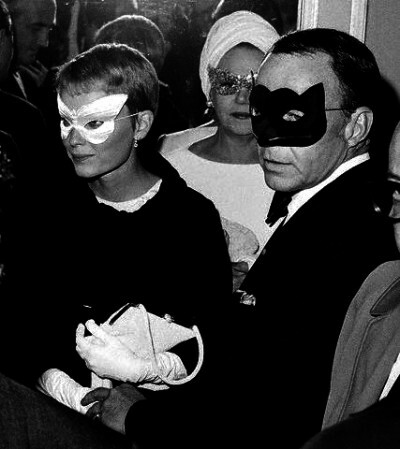 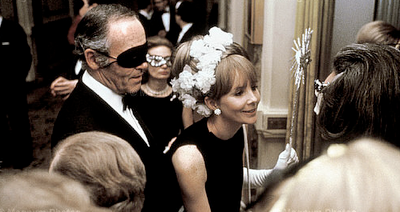 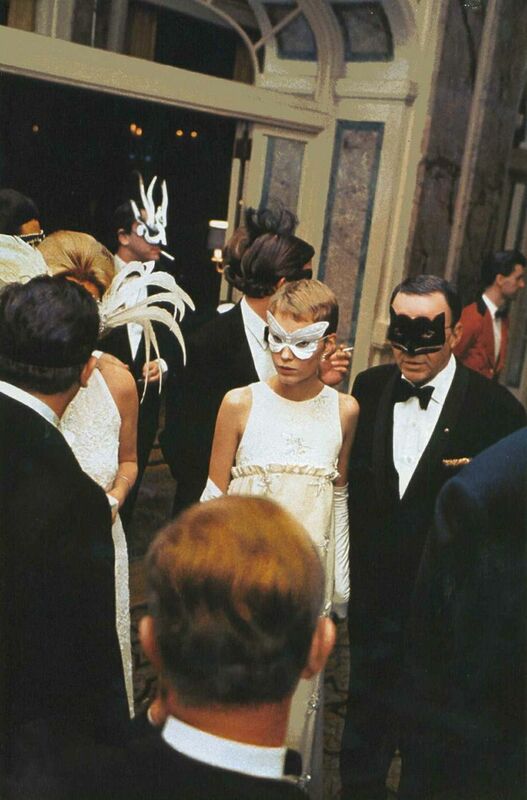 The masks were Capote’s way of stripping his guests of their celebrity power, in sort of an insolent way. Model and Swinging London style icon Penelope Tree, attended at age 17. 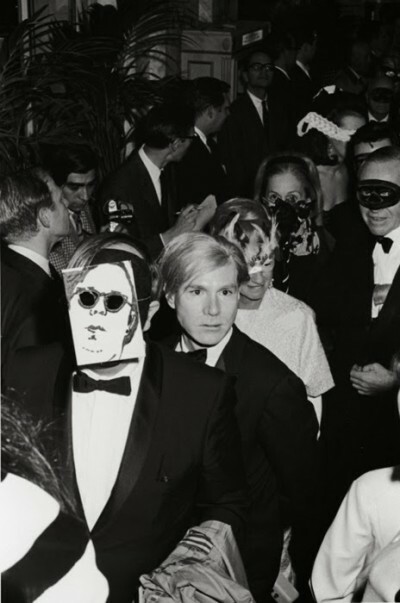 Andy Warhol, was the only guess not wearing mask. 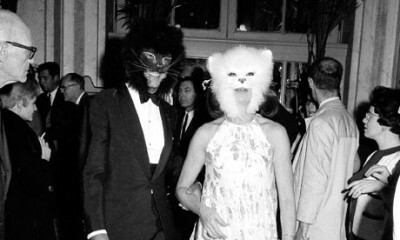 Designer Oscar de la Renta. 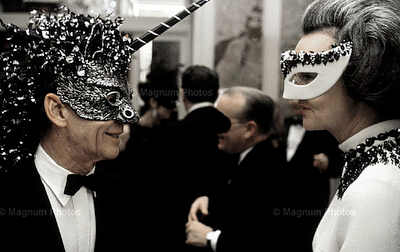 Gene Moore created for the interior designer Billy Baldwin this unicorn spectacular mask. 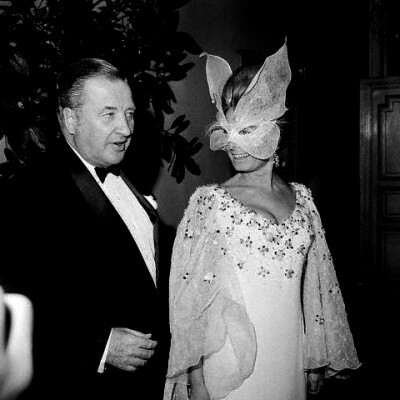 Jean Harvey Vanderbilt compared the party to the court of Louis XV because “people promenaded around the perimeter of the room in their finery, looking at each other”. 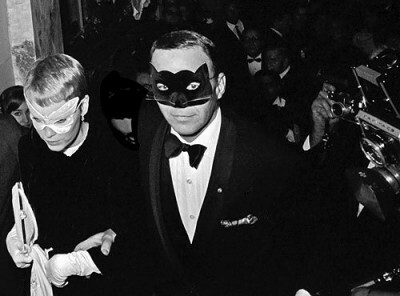 Frank Sinatra with Mia Farrow sporting Vidal Sassoon’s hair styling for the film Rosemary’s Baby. 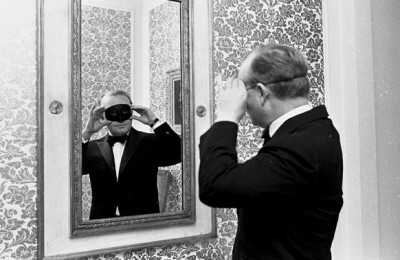 Frank Sinatra probably was the one personality too big for Capote’s charades to contain. As the story goes, around 2:45am he effectively shut down Capote’s Black and White Ball by announcing to his cronies that it was time to move on. 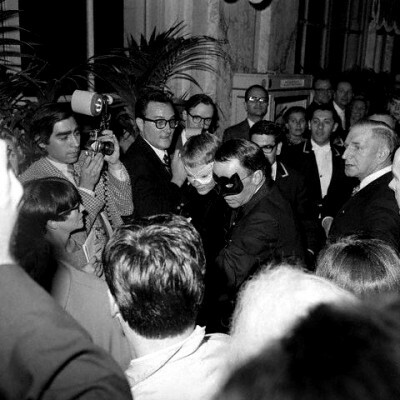 Capote begged Sinatra to stay longer, trying to physically block the exit when he departed, knowing that it would lead to the place clearing out. 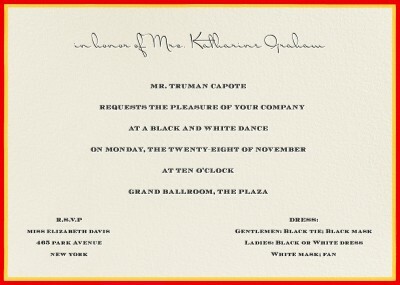 In order to shame those who had pretended they’d received invitations, Capote leaked his guest list to the press. The day after the party, the New York Times printed all 540 names. 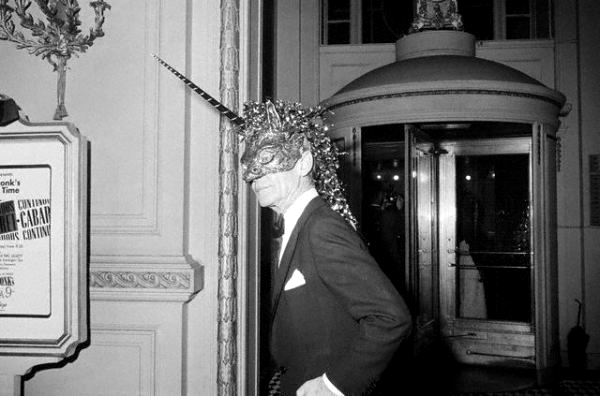 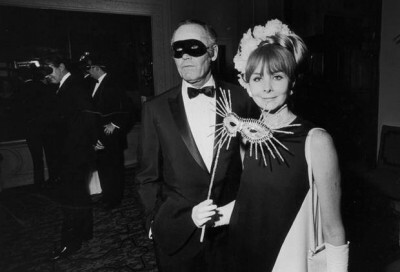 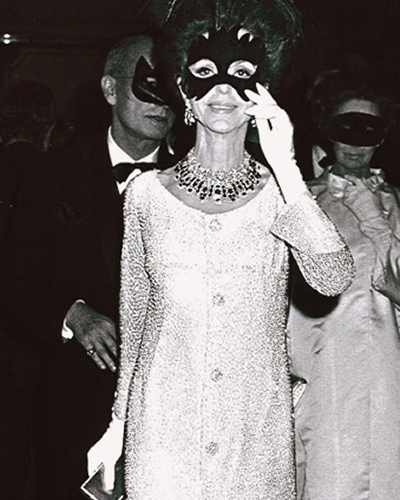 Here is the complete guess list to theMasked Black & White Ball: Mr and Mrs Gianni Agnelli, Count Umberto Agnelli, Edward Albee, Mrs W Vincent Astor, Mr and Mrs Richard Avedon, James Baldwin, Miss Tallulah Bankhead, Cecil Beaton, Mr and Mrs Harry Belafonte, Marisa Berenson, Candice Bergen, Mr and Mrs Irving Berlin, Sir Isaiah and Lady Berlin, Mr and Mrs Leonard Bernstein, Mr and Mrs Benjamin Bradlee, Mr and Mrs William Buckley, Mr and Mrs Richard Burton, Prince Carlo Caracciolo, Lord Chalfont, Dr and Mrs John Converse, Noël Coward, Mr and Mrs Walter Cronkite, Mr and Mrs Sammy Davis Jr, Oscar de la Renta, Marlene Dietrich, Elliott Erwitt, Douglas Fairbanks Jr, Mrs Marshall Field, Mr and Mrs Henry Fonda, Joan Fontaine, Mr and Mrs Henry Ford 2nd, Mr and Mrs John Kenneth Galbraith, Greta Garbo, Ambassador and Mrs Arthur J Goldberg, Mr and Mrs Samuel Goldwyn, Henry Golightly, Hamish Hamilton, Ambassador and Mrs W Averell Harriman, Mr and Mrs William Randolph Hearst Jr, Mr and Mrs Henry J Heinz 2nd, Miss Lillian Hellman, Elizabeth Hilton, Horst P Horst, Christopher Isherwood, Maharajah and Maharani of Jaipur, Senator and Mrs Jacob K Javits, Lynda Bird Johnson, Philip Johnson, Senator and Mrs Edward M Kennedy, Mrs John F Kennedy, Mrs Joseph P Kennedy, Senator and Mrs Robert F Kennedy, Alfred Knopf, Mr and Mrs Joseph Kraft, Mrs Patricia Lawford, Mr and Mrs Irving Lazar, Harper Lee, Vivien Leigh, Mr and Mrs Jack Lemmon, Mr and Mrs Alan Jay Lerner, Mr and Mrs Alexander Lieberman, Mr and Mrs Robert Lowell, Mr and Mrs Henry Luce, Shirley MacLaine, Mr and Mrs Norman Mailer, Mr and Mrs Joseph Mankiewicz, Mr and Mrs Walter Matthau, Mr and Mrs Robert McNamara, Mr and Mrs Paul Mellon, Mr and Mrs James Michener, Mr and Mrs Arthur Miller, Mr and Mrs Vincent Minnelli, Mr and Mrs Samuel I Newhouse Sr, Mrs Stavros Niarchos, Mike Nichols, Lord and Lady David Ogilvy, Mr and Mrs Gregory Peck, George Plimpton, Prince and Princess Stanislas Radziwill, Mr and Mrs Jason Robards Jr, Governor and Mrs Nelson A Rockefeller, Philip Roth, Baroness Cecile de Rothschild, Baron and Baroness Guy de Rothschild, Theodore Rousseau, Mr and Mrs Arthur Schlesinger Jr, Mrs David O Selznick, Mr and Mrs Irwin Shaw, Mr and Mrs Frank Sinatra, Steve Sondheim, Sam Spiegel, Mr and Mrs John Steinbeck, Gloria Steinem, Mr and Mrs William Styron, Mr and Mrs Arthur Ochs Sulzberger, Ambassador and Mrs Llewellyn E Thompson, Penelope Tree, Mr and Mrs Alfred Gwynne Vanderbilt, Mrs T Reed Vreeland, William Walton, Mr and Mrs Edward Warburg, Andy Warhol, Mr and Mrs Robert Penn Warren, Mr and Mrs John Hay Whitney, Mr and Mrs Billy Wilder, Tenessee Williams, Mr and Mrs Edmund Wilson, Duke and Duchess of Windsor, Darryl Zanuck.